After college, Ashley moved to London, close to Battersea Park, which became the backdrop to the series ‘The Fear and Thrill of the Chase’, about an idyll, about friendship, love and desire, the inarticulate self, communicating emotions through paint. Setting up a studio in the empty house next door, the first painting ‘In the Park’, with the four friends in the top left corner and showing river, lake and the view through trees, highlights the multi-viewpoints, both real and imaginary, that continues to dominate his work. The large scale ‘The Garden of Eden’, referenced literature for the first time, taking the idea of the masque and the manipulations of reality and fantasy from ‘The Magus’ by John Fowles. There are further references in the series to ‘The French Lieutenants Woman’ both film and novel, the paintings of Edvard Munch, Joni Mitchell’s ‘Hejira’ and Joy Division’s ‘Closer’, from where the series gets its name. 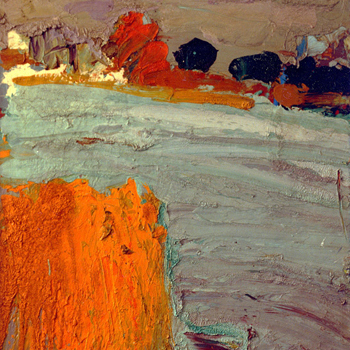 ‘In the Park’ was shown in ‘The London Group’ exhibition at the Royal college of Art in 1984. ‘Southolm St’ was shown in the Royal Oil Institute exhibition at the Mall Galleries, London in 1985 and bought by Lord Gowrie, former Minister of State for the Arts.